We’re taking a break from article writing, so there isn’t a feature article in this edition. Instead, we are including an an extended Car Showcase. From Shawn Stebleton: Regarding your article on unusual tracks (Volume 8, Issue 5), the first of the two loop tracks shown (the red one with the jump following) is from our pack, Pack 207 in Murrysville, Pennsylvania. Our Cubmaster built it about ten or twelve years ago. 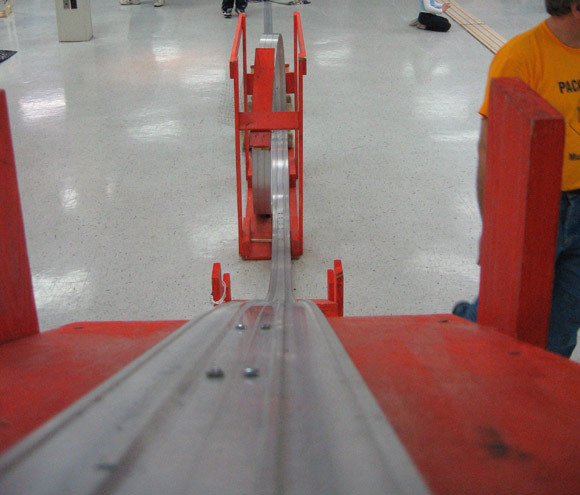 We use it every year for our pinewood derby “Fun Day”, a build workshop combined with lots of fun. Not viewable in the picture you have is a net through the center of the loop to catch most cars that are unable to complete the circuit. 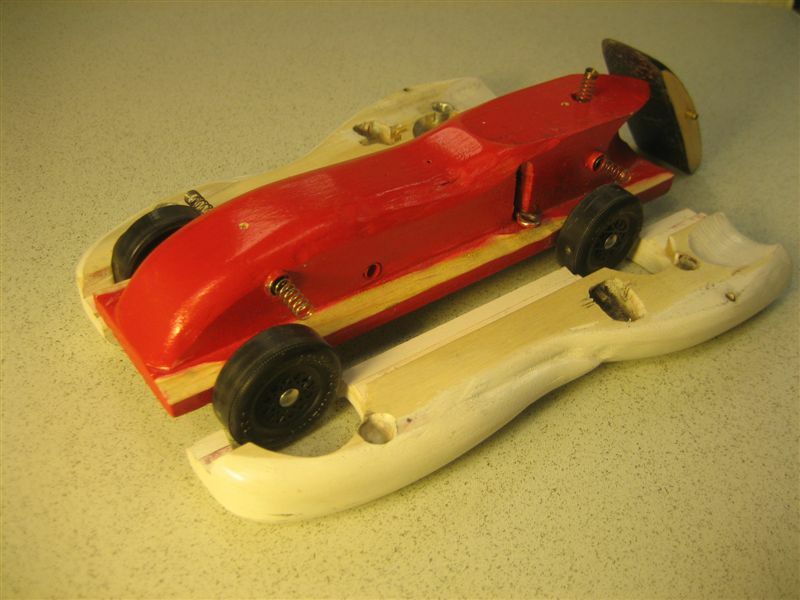 Ironically, only the fastest cars — those with proper weight placement, good alignment, and polished axles/wheel bores — can make it through the loop successfully, and those are the cars the good builders don’t want to risk on such a track. I don’t remember exactly the story, but our Cubmaster said that someone from Canada had seen or heard of his track and wanted to build one similar to it. The picture of the other one is the result. Operated as a pack fund raiser, the Fun Day is open to all scouts from not only our own pack but neighboring packs too. We have a station for cutting cars, including band saws (parents operate these), coping saws, rasps, sandpaper, etc. Weights, extra car kits, craft display stands, food, and other items are for sale. Parents bring lots of tools too, (I bring my Dremel and plunge router attachment, among other items) and freely share them and help any scout that asks. Teaching a scout how to use a tool (and understand the why behind it) is a great feeling. 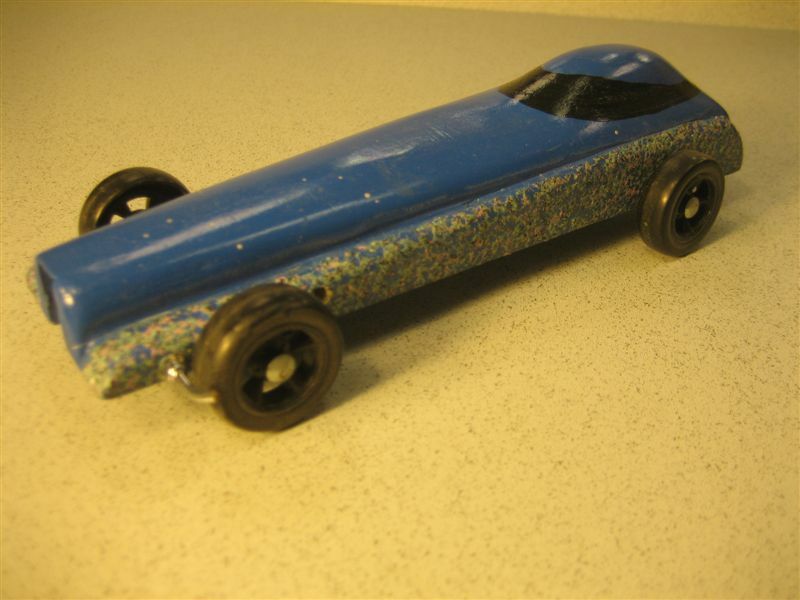 It’s held on a Saturday in early January, usually two weeks before our pack Pinewood Derby, and runs from about 8:30 am until 3:30 pm. Our next one is coming up January 10th, 2009. The scouts can work on building their cars, test them, and enjoy running them. Cars from previous years are welcome on the loop-and-leap track, as most boys don’t want to use their new cars in such a way, for fear of damage. 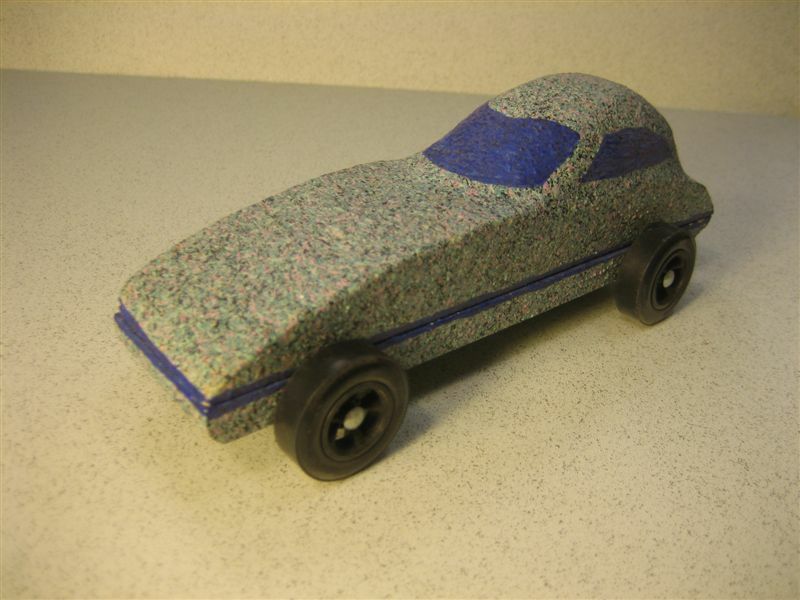 We also have a Demolition Derby track (our pack supplies cars to be smashed up) and a seat-belt demonstration track, with raw eggs as “passengers” and removable elastic straps that represent seat belts. 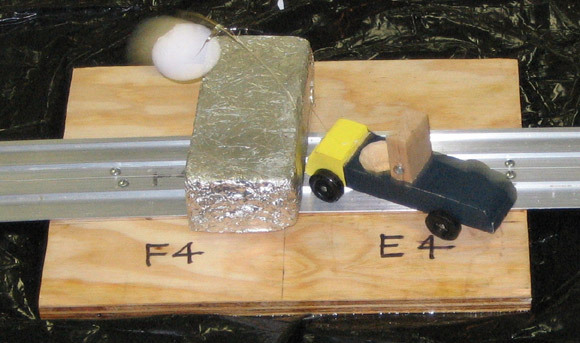 We make some runs head-on with another egg car, and some head-on into a brick, both with seat belts and without. The scouts love it when eggs get smashed in a collision! It drives the point home about not getting your head smashed like the egg. Here are some pictures from a previous year’s Fun Day event. We typically have about 100+ Scouts (accompanied by parents) throughout the day, some for a few hours, some all day. Today’s showcase cars are from Chad Thorvilson. I have been involved in the Cub Scouts since my son, Ryan, first started in 2000. 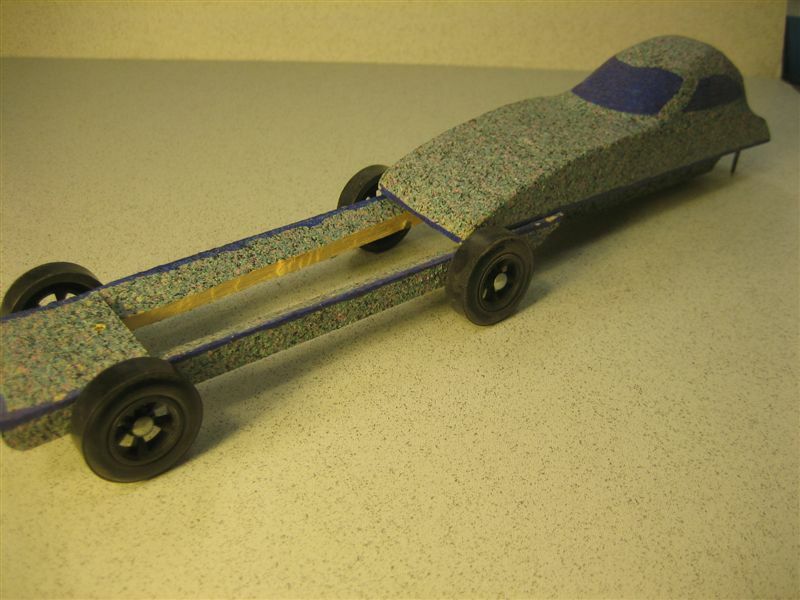 The second year of the pinewood derby I made a new four lane Formica track for the pack. He is now in Boy Scouts, and he and I still help run the track. We have always enjoyed making cars and other projects in the shop. We no longer race, but we still make cars every year. 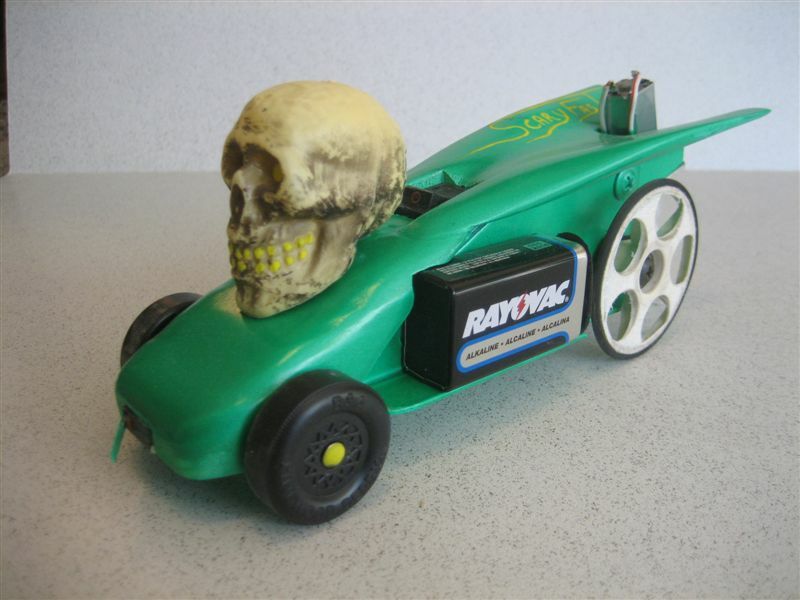 The last few years I have been making trick cars. This white and red car has a trigger on the bottom that releases the sides and roof. 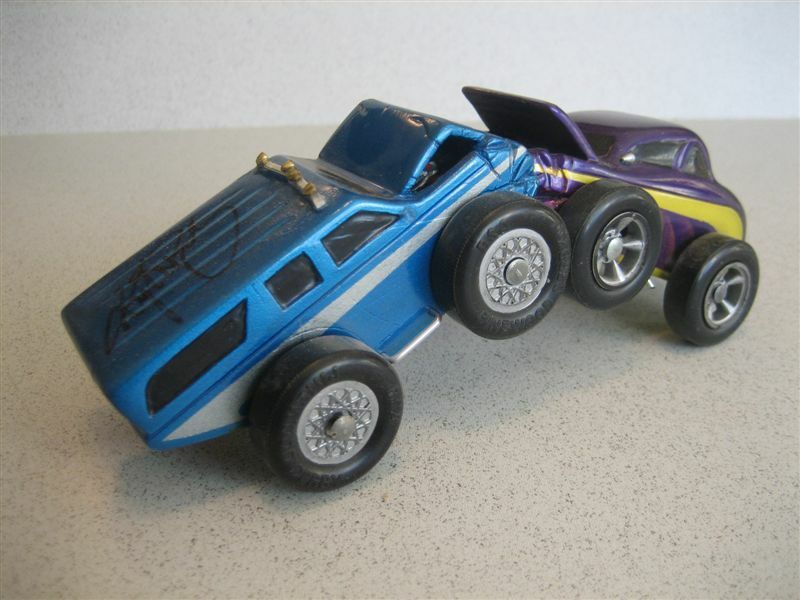 A small wedge is put on the track and when the car crosses it the sides and roof pop off. The light blue speckled car leaves the cab behind as the tires and frame go down the track. 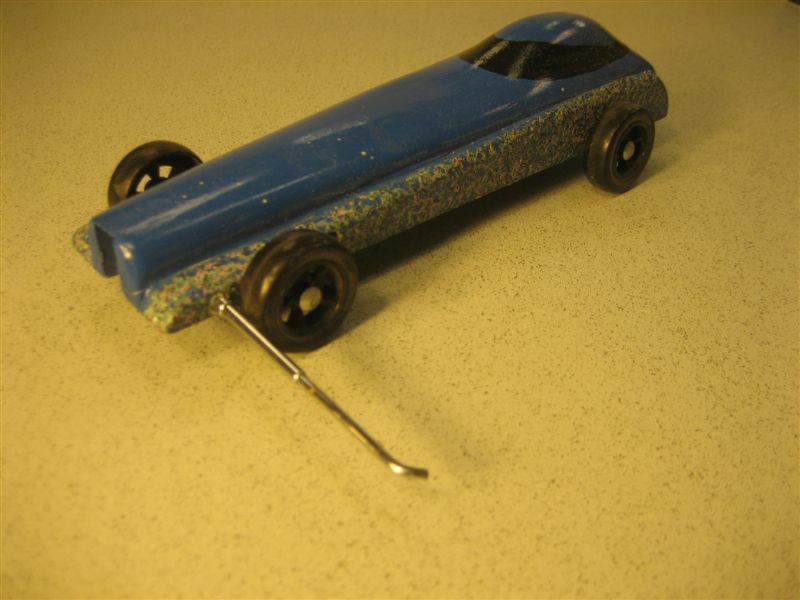 This blue car has a piece of radio antenna that I pull out to hold the competition back. 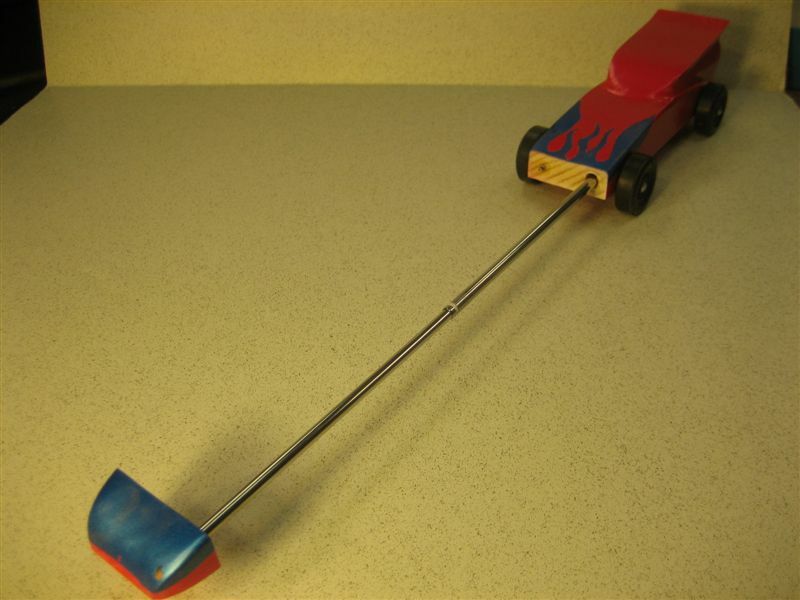 The red and blue car has a nose attached to a radio antenna. I pull out the nose and tell the boys that I will beat them by this much. I also have a car with a small motor geared to the tire to make it run very slow (not shown). 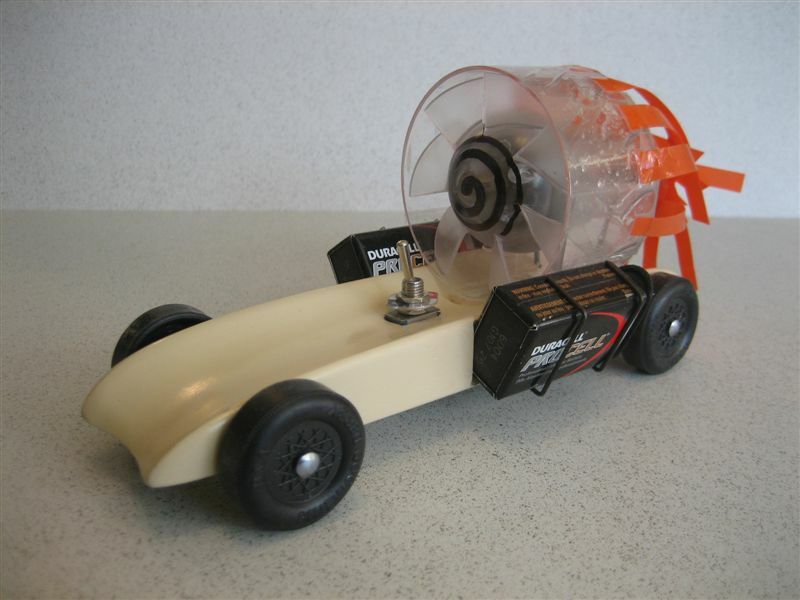 Here is my fan powered car and string/motor car. 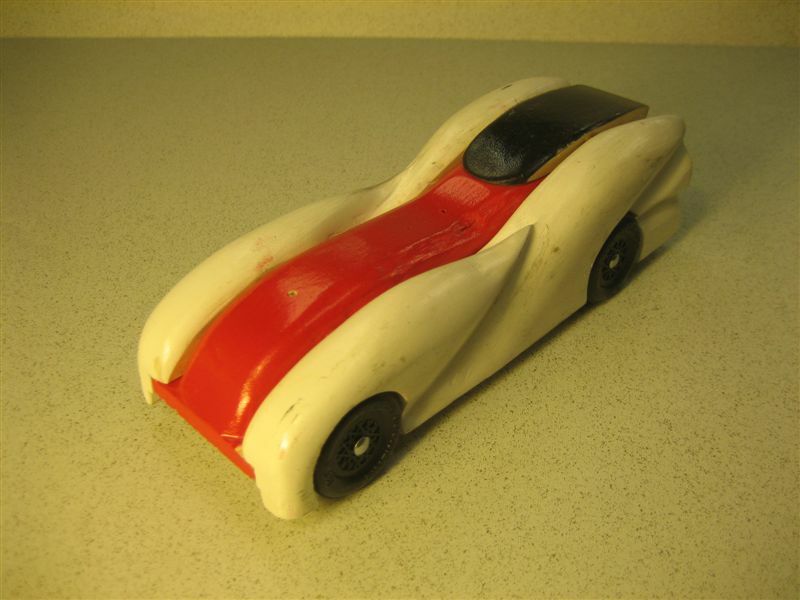 We have also made some nice cars. We were finalists in the Lowes/Dremel contest one year and grand prize winners the last year they had the contest. 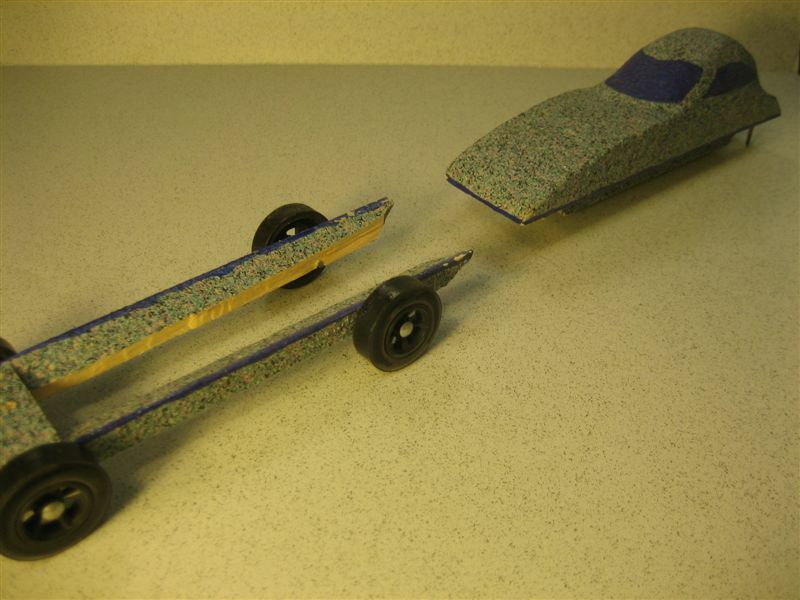 We look forward every year to the pinewood derby and working in the shop together. 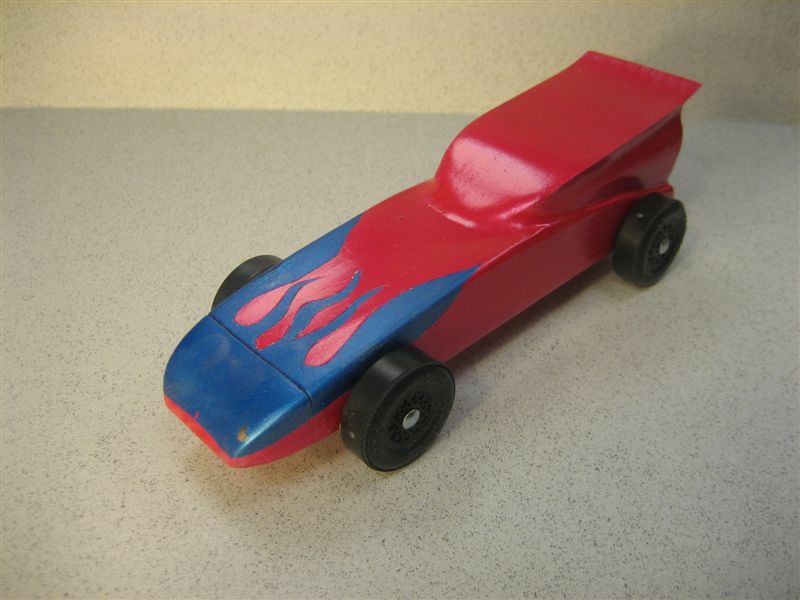 I get excited when the first Pinewood Derby Times arrives in my inbox. When Nathan (name changed) came to us two years ago (second grade then), he would not talk to us much, and when he did he kept his head down and wouldn’t look up to speak to us. He hadn’t experienced love from his parents; basically they have checked out. His self confidence and self-esteem were very low and he had a lot of pent-up anger and frustration. Nathan lives with his Grandparents, and his Grandmother sees to it that he gets to attend the weekly Ranger meetings. We have continually prayed, and worked with Nathan to obtain any change. This past race season, Nathan designed a car and painted it with some help. I was thrilled to see him receive trophies (1st Place) for the design and speed of his police car at our sectional pinewood derby race. In fact all of the Ranger Commanders were excited for him and his win. He had a big smile on his face and I did too! Lately he talks to me and the other commanders quite a lot, and he is coming out of his shell a little at a time as he learns to trust us. Recently, Nathan told his Grandma that what she needed was some hugs. It seems that he was being disobedient and didn’t want to follow her direction, so he tried to side track her with that comment. She was laughing when she told me about this, saying that we had been the reason for him to think about having and giving a hug. Your book (as well as many others) focuses on lead or tungsten for weight. I have used large washers and buckshot with great results. Have I just been lucky? Denser weights allow the weight to be focused in one area, which appears to have some benefit in performance (I plan to run tests on these over this coming summer). 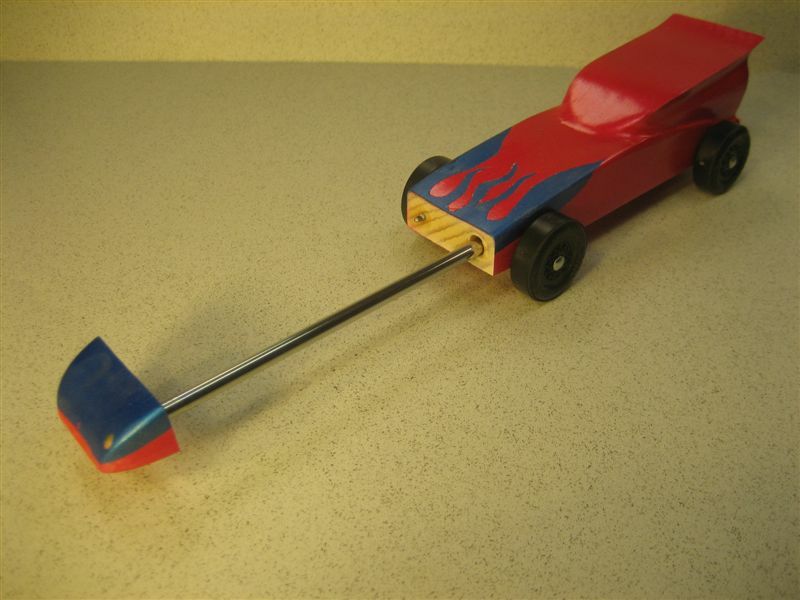 The Pro-Body Tool doesn’t fit on the BSA Pinewood Derby block that we have. It is just a few microns too narrow. Is the tool defective? Do I need to sand the block? BSA blocks vary a bit in size depending on the setup at the mill. So some are a bit too big, while some are a bit too small. If the block is too big, then sand a little bit off of one side to get it to fit. If the block is too small, then insert paper on one side to tighten up the fit.